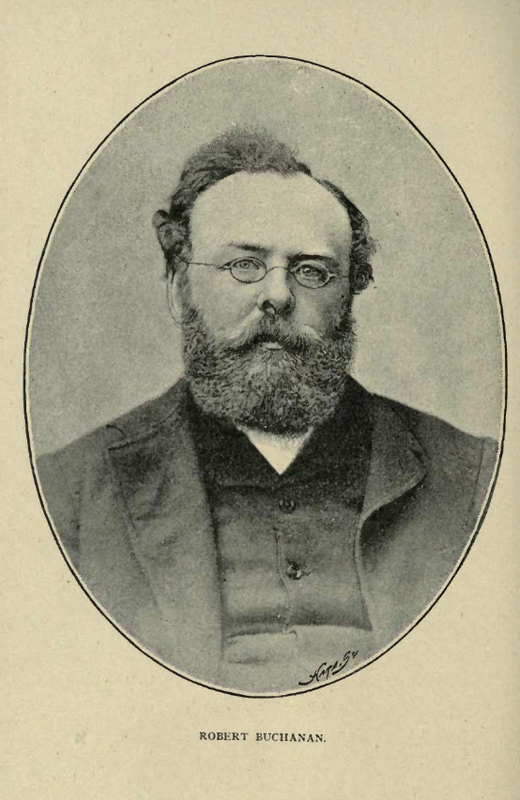 ROBERT BUCHANAN, the son of a well-known Socialist missionary, long resident in Glasgow, was born at Caverswall, Staffordshire, Aug. 18, 1841, and was educated at the High-school and University of Glasgow. At an early age he began the career of a man of letters, and in 1860 issued his first volume of poems with the title of Undertones. While it occasionally reflected the manner of Browning and Tennyson, the volume clearly showed that it was the offspring of a genuine poet. His second work, Idyls and Legends of Inverburn, while inferior to Tennyson’s idyls as ornate compositions, are for unstudied pathos and humour greatly superior to the laureate’s. In this volume Mr. Buchanan’s foot is on his native heath, which he bestrides with as much pride as affection. London Poems, his third publication, containing the most representative and original of his creations, was followed by a beautifully illustrated volume entitled Ballad Stories of the Affections, translated from the Scandinavian. His other publications are North Coast and other Poems, The Book of Orm, The Drama of Kings, and The Land of Lorne. The latter volume contains a very full and sympathetic account of the Burns of the Highlands—Duncan Ban Macintyre, to whose memory a monument was recently erected at Glenorchy. Mr. Buchanan is also the author of “A Madcap Prince,” a play produced at the Haymarket Theatre, London, 1874, but written in youth; “Napoleon Fallen,” a lyrical drama; and the tragedy of “The Witchfinder,” brought out at the Sadler’s Wells Theatre, London. He has edited several works, including a memoir of John James Audubon, the American naturalist, written by his widow; an edition of Henry W. Longfellow’s poems; and is a frequent and favourite contributor to many of the leading magazines. Mr. Buchanan also published anonymously two widely-circulated poems, “St. Abe,” and “White Rose and Red,” both of which he has recently acknowledged, and each of which has gone through many editions. An edition of his acknowledged poetical and prose writings is being published in London in five handsome volumes. In 1870 he received from Mr. Gladstone a pension of £100 per annum, in consideration of his literary merit as a poet. From the chapter, ‘Are We Advancing? (1882-1886)’ (pp. 24-28). “Lady Clare,” at the Globe, was a fairly workmanlike adaptation of “Le Maître de Forges,” better than the French piece afterwards translated for the St. James’s, in so far that it did not presuppose a knowledge of the novel. There was a good deal of unnecessary vulgarity in the character-drawing, but on the whole it may perhaps be called the best thing Mr. Buchanan has done. “Storm-Beaten,” at the Adelphi, was a prodigious piece of pasteboard-and -size melodrama, amusing in its blusterous, bombastic, transpontinism. What chiefly impressed me in it was the audacity with which the curtain was brought down three successive times upon practically the same situation. What probably attracted the public was a grotesque scene at the North Pole or thereabouts, in which Mr. Charles Warner, Mr. Barnes, and an Aurora Borealis played some fantastic tricks before high heaven. “A Sailor and his Lass,” written in collaboration with Mr. Augustus Harris, may be shortly described as the worst of recent Drury Lane melodramas, and to have produced the worst of that sublime series is certainly a distinction. “Bachelors,” at the Haymarket, a comedy from the German, written in collaboration with Mr. Hermann Vezin, was antiquated in plot and dull in dialogue, but otherwise inoffensive. Lastly, Mr. Buchanan, collaborating with Miss Harriet Jay, has treated us to a portentous melodrama at the Olympic, entitled “Alone in London.” Though a little better than “A Sailor and his Lass,” it was a mere patchwork of threadbare characters and worn-out sensations, a shambling and clumsy puppet-show. If it was really successful, Mr. Buchanan can certainly plead justification for holding in low esteem the intelligence of the British playgoer. I have spoken my mind freely on what I conceive to be Mr. Buchanan’s shortcomings, because I suspect him of the most unpardonable sin a craftsman can commit—that of not doing his best. Nature has denied him any great share of the dramatic faculty, but it is incredible that a man of his talent and culture should be unable to turn out better work than “Storm-Beaten,” “A Sailor and his Lass,” and “Alone in London.” As it is, the graduates of the Grecian write every bit as well as Mr. Buchanan, and construct a vast deal better. When we see a man striving honestly to be an artist, he commands our respect, however unsuccessful his efforts; but when one who should be an artist deliberately elects to play the showman, we have no hesitation in saying with perfect frankness that he is but a poor showman after all. 1 Mr. Buchanan disclaims responsibility for two anonymous plays which have been currently attributed to him—“The Exiles of Erin; or St. Abe and his Seven Wives” at the Olympic, and “Lottie” at the Novelty—the latter an amusing little piece. Was creeping ben, his shadow on our hearts. Then, in his “Book of Orm,” we see him dealing with all the problems of Life and Death, of Man and Nature, as seen through the Celtic imagination. He translates us to a world of dream, yet a world in which the grand realities of life stand out bold, like vast mountains whose lofty heads are lost in mist, yet faintly outlined. The sections in the “Book of Orm” titled “Songs of Corruption” and “A Dream of the World without Death,” are in the deepest sense informed of imagination and phantasy. You are moved to a sense of some vast, vague, shadowy, impressive presence which, felt or unfelt, is weird, fateful, and inevitable, hovering over all life and touching it with awe and wonder. The manner in which Mr. Buchanan traces out and justifies, in a poetic sense, the bliss of gradual dissolution is at once elevated and powerful. The picture of the void left on the sense and the imagination by the sudden disappearance of all trace, even of the poor body, as the dewdrop melts in the sun, the horror as of some awful fate for ever hovering above and around, is suffused with the sense of mystery and awe, and the recovery, as if from some nightmare dream, is equally fine. And my tears flowed fast and free, but were not bitter. And could bear at last to put her in the darkness. Dropped awful on the hard wood, yet I bore it. Which softeneth the mystery and the parting. Here the dramatic medium, thin and unsubstantial as it was, preserved unity of impression which, it must be admitted, has not been quite so well preserved in some other of his works, more directly penetrated by what we must, for want of a better term, call the insurgent or revolutionary spirit. His recent poem, “The City of Dream,” powerful and effective as it is, in parts, hardly seems to us so sustained or self-consistent; and the very comparison with Bunyan’s “Pilgrim’s Progress,” which the author himself so boldly suggests by the very form chosen, as well as by the Prefatory poem, strikes us as somewhat unfortunate. But the author’s genius is as fully declared in it as his primary purpose. It makes us think too much, however, of Poe’s idea of long poems as only collections of short ones more or less skilfully connected together; and indeed an exacting criticism might set it down as the besetting fault of Mr Buchanan that he too often tries to do by expansion what could only be accomplished by concentration and more elaborate finish, as he has himself implicitly confessed in his withdrawal of much of that rather ponderous effort, “The Drama of Kings,” which was a fiasco, exhibiting in its worst phase this tendency, which he has learned to guard against, but has not yet completely overcome. The air was thick with snow. Adonai! Lord! art thou a phantom, too? Where thou, O Master, weeping, wanderest too! Cut down and conquered, smitten to the knees? Against one dogma of Calvinism he has taken up his parable, and has directed several of his poems against it—notably “A Scottish Eclogue.” This is the doctrine of reprobation, of eternal damnation. His faith is wide; and he would fain, in the words of one of Dante’s characters, make the Almighty arms in the long run embrace all that returns to them. Mr. Buchanan is thus, in a sense, a moral and religious force as well as a poet, and it is hardly possible to consider him in either aspect separately. His most effective novels also are penetrated by the same ethico-religious aims. Through the green haze flowing. All is light and motion. He has also written some powerful ballads based on historical incident, the most powerful and imaginative of which is, perhaps, the “Battle of Drumliemoor,” in which the Scottish Covenanting or Puritan spirit is most dramatically presented. Mr. Buchanan is the son of a newspaper editor, and was born in Glasgow in 1840. His father was then connected with the Argus; and was well known in literary circles. His son soon showed great gifts, and his education was carefully attended to. As a boy, he rambled much amid the scenery of the West Coast of Scotland and the Hebridean Islands, which he was the first effectively to describe with true poetic and picturesque insight (as his Hebridean sketches prove): the impressions of his boyhood being confirmed, and revised by many later visits, when he made intimate acquaintance also with the Celtic dwellers and their ways. Many hints of the impressions produced by these experiences are found in his writings, as well as of residences among the Celtic people of Brittany, of which many reminiscenses are skilfully made use of in his remarkable story, “The Shadow of the Sword,” one of the most romantic and picturesquely powerful novels of our time. Among his travels are to be found some sketches of Etrètat and the neighbouring coasts, where for a time he resided. At an early age Buchanan entered the University of Glasgow, where he was a successful student; but before he had completed his curriculum in arts, he left the city, along with his friend David Gray (whose memoirs he has written), to push his fortunes in London. He had some stories and poems in his pocket; and at first found it hard to get people to believe in him, as has so often been the case before. David Gray sickened and returned home to die, before his book, “The Luggie, and other Poems,” was published, though Monckton Milnes (Lord Houghton later) had taken him by the hand. Buchanan remained, and at length found a secured position; Mr. G. H. Lewes and Mr. Hepworth Dixon asserting his claims to recognition. 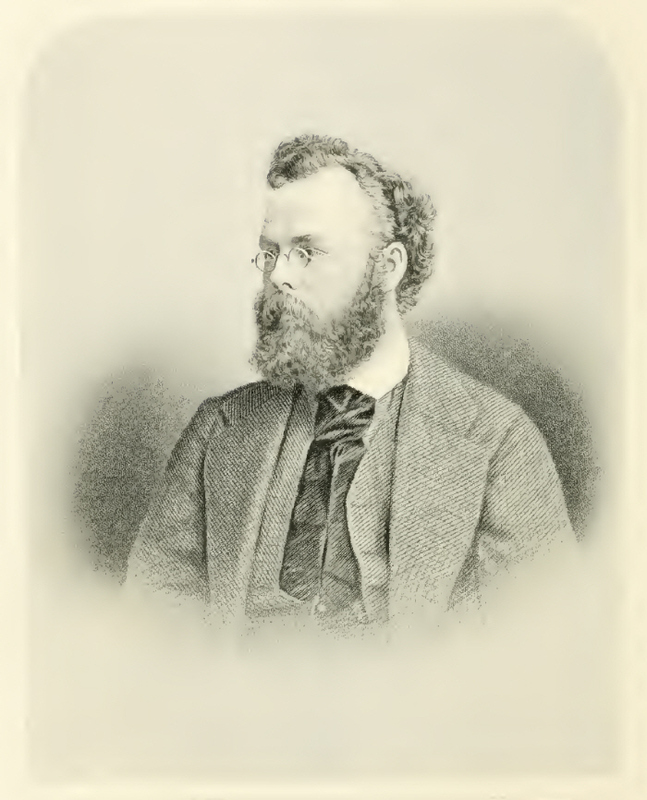 He wrote largely in Good Words and the Argosy, and has contributed to many other periodicals; but his largest works have not been susceptible of magazine publication, though it must be said that some sections of “Balder” appeared in the Contemporary Review. At one time, Mr. Buchanan lived at Bexhill-on-Sea, near Hastings, in a pretty little cottage that on one side commanded a view of the sea, and on another of the country stretching over towards Battle. The readers of his poems will often come on little bits of description which, if they happen to be familiar with that district, they could hardly fail to identify. He has himself confessed to the influence of the life at Bexhill in a poetical preface, which he prefixed to a volume of his poems some years ago. Mr. Buchanan spent some years in Connemara, where he made the acquaintance of the Irish people, and studied their characters, his sister-in-law, Miss Harriett Jay, having, however, done more as yet definitely to interpret them in her novels than he has done. But it may be that such poems as the “Wake of Tim O’Hara” are due to these residences. More recently Mr. Buchanan has lived in or near London, devoting a good deal of time to writing for the stage, in which he has been successful, especially in his “Sophia,” an adaptation of the “Tom Jones” of Fielding; it is, however, a very free adaptation, with just as much of Mr. Buchanan as of Fielding in it, else it could hardly have succeeded so well with English audiences in these days. SIR,—You are perhaps the best existing type of the militant man of letters. Certainly none is readier to fight, none less awed by the quality of an opponent. You are not daunted by great names, nor restrained by considerations of policy. You donned your armour and furbished your blade as readily and joyously to meet the late Mr. Matthew Arnold as you now assume the fighting gear to meet Mr. Andrew Lang, or Mr. George Moore, or Mr. Edmund Yates, or Mr. Labouchere. The challenge never comes to you in vain; nor are you to be disturbed with impunity. The thistle might well be engraven on your shield, and ‘Ready, aye ready’ would not be an inappropriate motto. Like the bold Macpherson, your literary life has been one of ‘sturt and strife.’ From that early assault on ‘The Fleshly School of Poetry’ to the recent bombardment of ‘Imperial Cockneydom,’ 222 you have encountered many a doughty warrior, and dealt many a weighty and valorous blow. And the spirit of the fray is still strong upon you. To-day, as in times past, you present yourself with girded loins and an undiminished ardour for battle. I suppose there are times when you would really prefer not to fight, but the public knows nothing of you in such moments of weakness. So far as you are known to your readers, the arms are always in order, and the spirit ever eager. 226 This is, I dare say, as characteristic as anything you have written, and made as great a demand on courage as any conflict in which you ever engaged. Moreover, it is evidence that you have learned the greatest lesson which destiny has to teach—that of being true to one’s-self—in other words, the necessity of overcoming all fear—fear to acknowledge a fault as well as fear to storm a stronghold. ‘He has not learned the lesson of life,’ says one whose silver pen you have yourself extolled, ‘who does not every day surmount a fear. . . . Have the courage not to adopt another’s courage. There is scope, and cause, and resistance enough for us in our proper work and circumstance. And there is no creed of an honest man, be he Christian, Turk, or Gentoo, which does not equally preach it. If you have no faith in beneficent power above you, but see only an adamantine fate coiling its folds about nature and man, then reflect that the best use of fate is to teach us courage, if only because baseness cannot change the appointed event. If you accept your thoughts as inspirations from the Supreme 227 Intelligence, obey them when they prescribe difficult duties, because they come only so long as they are used; or if your scepticism reaches to the last verge, and you have no confidence in any foreign mind, then be brave, because there is one good opinion which must always be of consequence to you—namely, your own.’ I do not think it will be denied by any one who has watched your career and studied your writings, that your opinions are most distinctly your own. You do not belong to the flaccid class that eternally assents; you are not one of those who live in perpetual fear of giving offence; nor will it be gainsaid that whatever difficult duties your conscience prescribes, you perform to the uttermost of your ability. That they were my glory and joy. They are dust, they are changed, they are gone! seem to me to give out the right tone. But I am more concerned with you as an artist than as a critic. 229 You have been a busy worker in the realm of imagination, and, to my mind, a successful worker. You have written too much to be always at your best, but your worst is never bad. You have not had, or you have not taken, the leisure to excise, polish, and amend your productions, as among present-day poets Lord Tennyson and Mr. Lowell have done, or among past poets Pope and Gray. But you are always a poet, and invariably an artist. Many of your poems are exquisite in form, and nearly all of them attest beyond a peradventure that even at the close of the nineteenth century the spirit of poetry is still in our midst. No one can read Balder the Beautiful, or The Book of Orm, or The City of Dream, without being convinced (if he have an eye and ear for such things) that he is reading the work of a true poet. Nor is your prose less true or less important than your poetry. As a novelist you work with a purpose. You descend, as you say yourself, to the heresy of instruction. Many eminent critics do hold it a heresy to descend to instruction in works of fiction, and many great authors are with the 230 critics. Goethe (whom you will permit me to call great), for instance, says in reference to his own Werther, in that autobiography which every student of literature should read, ‘It cannot be expected that the public should receive an intellectual work intellectually. In fact, it was only the subject, the material part, that was considered, as I had already found to be the case among my own friends, while at the same time arose that old prejudice, associated with the dignity of a printed book— that it ought to have a moral aim. But a true picture of life has none. It neither approves nor censures, but develops sentiments and actions in their consequences, and thereby enlightens and instructs.’ These are Goethe’s sentiments on the subject. He did not believe in the novel with a purpose; nor did Scott consider himself under any necessity to be didactic. Shakespeare, likewise, was careless of his opportunities to play the rôle of schoolmaster, and it is my candid opinion that Homer never really concerned himself about the moral and social welfare of his auditors. This man alone of all men that I see! Give him to me and to misery! Give me this man if a God thou be. But there is no God to hear me cry. Of the foul things thought, and dreamed, and done! All living men beneath the sun. Give up the man I hate to me! And I shall know Thou art God indeed. And with the bloodthirstiness of a sleuth-hound he tracks his prey from point to point, on land, on sea, in green England, and amid the snows and ice of the Polar regions, till at last he has him fast; and then—then vengeance swift and terrible—ah! no, only a temporary madness, a momentary exultation, a 234 spasm of cruel delight in the misfortunes of Richard Orchardson, and then God smites the heart of the would-be murderer, till it melts and gushes like the hard rock in Horeb. His behaviour, when Richard Orchardson lies dying before him, is piety itself. ‘When I knew that he was dead indeed, I bent over him reverently, placed his arms down by his side, and seeing his eyes wide open, drew down the waxen lids over the sightless orbs. Then I held a little water in the palm of my hand, and cleansed the dead face; afterwards with careful fingers arranging his hair and beard. Lastly I took one of my rude lights and set it at the corpse’s head, like the death-lights we burn round dead folks in the Fens. . . . When I had ordered all in Christian cleanliness and reverence, I sat and gazed upon mine enemy. . . . Then one still morn, when the air was bright for the place and time of year, I lifted him in my arms and carried him slowly forth across the snow. I had the rude grave all ready, and now I laid him down within it, with his white face to the sky. As I stood above him, and took my last look of him, more snow began to fall. . . . 235 Then standing bareheaded, eager still to keep my pledge to him, I repeated, as far as I could remember, the words of the old sweet Burial Service out of our English Book of Prayer; and when I could remember no more, I stretched out my arms in blessing, commending my enemy’s soul to God. Before I had ended, his face had faded away in the falling whiteness; and seeing it vanish utterly, I sobbed like a little child.’ And so Christian Christianson has his revenge, pouring out his heart in sorrow. The other characters are almost equally well drawn, and there are throughout the book many delightful bits of description, and situations that thrill one to the marrow; but over these I may not now linger. Sufficient to say that so long as we have writers writing books like God and the Man, there is still hope for the literature of our country. I have spoken of Mr Buchanan’s versatility as exhibited in various classes of intellectual endeavour— poems, novels, plays, and so forth; but if he is studied simply as a poet this versatility is no less impressive. Apart from the work of the laureate, no body of contemporary verse presents the same variety of imaginative, emotional and intellectual appeal; and though variety is not in itself a thing of price, it becomes distinctly valuable when it can be recognised as an indication of the fecundity of a richly vitalised nature. Now this is the kind of variety which is distinguishable in the work of Mr Buchanan—the variety which must make itself manifest in the outcome of an impulsive energy which no single conduit of expression suffices to exhaust. His purely lyrical poems—such for example as ‘The Fairy Reaper,’ ‘Spring Song in the City,’ and the lyrics in ‘White Rose and Red’— are so full of the essential spirit of song as to leave upon the mind of the sensitive reader the impression that the writer is pre-eminently a lyrist—a simple maker of the winning music of melodious verse. Then, while this impression is strong upon him, he turns to 161 other groups of poems, and finds that though the purely sensuous charm of music is still there, it has taken a subordinate place, and the man who seemed but a singer reveals himself as a dramatic creator, a philosophical mystic, a winning story-weaver, a maker of ballads that have the strength, simplicity and directness belonging to the ballad-work of a less sophisticated day. to any of the ‘Songs of the Veil’ in The Book of Orm, the Celt, where Mr Buchanan’s work, so far as outward form is concerned, bears the strongest resemblance to the work of his great predecessor. The later poet can never detach himself from the simple familiarities of human life, and even when the solemn veil is lifted and the divine Face is disclosed he turns from the ineffable vision to the homely world on which the Face looks down. Of course this is not quoted as an example of Mr Buchanan’s best work, but as an illustration of that instinctive habit of nature which impels him to reach things of spirit through the things of sense, to find in simple familiar humanity an avenue of approach to the unseen and the spiritual. He does not strive to render the mysterious awe of the unveiled Face in the heavens: he shows it reflected in the face of the child on earth. It is natural that Mr Buchanan should turn most frequently and spontaneously to those kinds of work in which his native bent towards the treatment of the simple humanities has full play. To compare him with Chaucer would be an absurd extravagance; but it is not extravagant to say that since Chaucer we have had no poet 164 who can be more emphatically described as a poet of flesh and blood. The name of Robert Browning will occur to many as that of a poet to whom the designation would apply, but Browning’s men and women are very largely either representatives of exceptional types, or of familiar types placed in an environment which confers on them an unfamiliar interest—generally the kind of interest involved in a somewhat complex moral problem. Mr Buchanan’s men and women have more of the primitive simple every day humanity which makes a permanent and universal appeal. Willie Baird, Attorney Sneak, Liz, Nell, Widow Mysie, and the three whose varying loves provide the tragic comedy of White Rose and Red are obviously nearer to the common mind and heart than are Bishop Blougram, the Queen of In a Balcony, Sordello, and Caponsacchi, highly vitalised as all these creations undoubtedly are. In sheer vividness of presentment the portrait of Widow Mysie the fascinating inn-keeper—sensuous, warm-blooded, cold-hearted and calculating—is a little masterpiece. ‘Oh, sweet was Widow Mysie, sweet and sleek! And tender were her tiny tinkling feet! This is an example of Mr Buchanan’s frankly realistic manner, in which the vigorous effectiveness of his flesh and blood treatment of a selected individual or type is most plainly apparent; but there is not less of rich warm vitality in the portraits painted with more of idealistic, romantic, or—as some would put it—poetic feeling. Such eminently characteristic poems as ‘Meg Blane,’ ‘The Scaith of Bartle,’ ‘The Glamour,’ and ‘Poet Andrew’ must be studied as wholes; but a few stanzas may be taken from a winning portrait study which has 166 not, I think, been reprinted from the pages of the Argosy where I read it many years ago. It was called ‘A London Lyric’ and might with propriety have been included in the volume of London Poems. And leaves a sense like dropping dew. Made of the dew and mountain shade. By mists upon a mountain peak. Over some tender thing that grows. Yet all have used her tenderly. What should appal her in the city? What should she fear in sun or shower? Familiar with the things of power. The vivid realisation which makes these and a score of other portraits glow with the warmth of life is not less manifest in Mr Buchanan’s rendering of nature and in his treatment of incident and situation. No nature-poetry of our time is less subjective than his, or freer from the intrusion of that ‘pathetic fallacy’ which, fascinating as it often is, denotes, as Mr Ruskin has shown, a lapse from perfect veracity 168 of imaginative vision. He is doubtless saved from it both by that healthful outwardness of mind which distinguishes the poet of observation and creation from the poet of sentiment and reflection, and partly by his absorbing interest in humanity which impels him to utilise Nature as a background rather than as a theme. The masterly and impressive picture of the great snow in White Rose and Red, so rich in rapid touches of detail and yet so broad in general effect, seems at first sight to have been painted for its own sake; but we soon perceive that, whatever be the feeling of the reader, it is to the poet simply, if one may so call it, an expedient—a means to the intensification of the pure human interest by the addition of a new element of terror and pathos to the weary pilgrimage of poor Red Rose to the home of the man who has deserted her. It is so everywhere. Nature is always subsidiary, but whenever its aspects or objects come into the composition as necessary elements they are presented with almost the substance and tangibility of things which appeal directly to the physical sensibilities of sight, hearing and touch. The force of the wind, the emptiness of the sky, the swirl of the sea, the mass of the mountain impress 169 us just in that same vivid way that we are impressed by the palpitating humanity of the men and women. Such endowments as these are pre-eminently the endowments of the balladist; and Mr Buchanan’s work has nearly always the ballad feeling, and frequently the ballad form as well. For reasons too obvious to need statement the making of ballads—without the final ‘e’—is rapidly becoming a lost art, but Mr Buchanan is one of the very few surviving inheritors of the old tradition. ‘The Ballad of Judas Iscariot,’ one of its author’s most arresting performances, has the directness, simplicity, and glamour of the ancient work, but the intellectual or spiritual conception which dominates it belongs to our own day, and therefore with all its power and beauty it is hardly so representative as are some of Mr Buchanan’s other achievements in this manner. ‘The Lights of Leith’ might, however, be a genuine antique, and it may be worth noting that it was the predecessor by some years of Rossetti’s noble poem ‘The King’s Tragedy,' the only contemporary ballad with which it can properly be compared. Blew snell thro’ sail and shroud. They cast their anchor down. But it is not a feast; it is for a much more grim and gruesome function that the fires are blazing on the quay of Leith. Twenty years before, the mate who with the skipper is watching the flickering flames and the black figures which pass and repass before them, has run away from his home and his widowed mother, drawn by the allurements of the adventurous life of the, sea, and now he is returning to her who, he knows, has been waiting for him so wearily, perhaps so despairingly. He leaps on shore and eagerly speeds to the familiar cottage, but though there are lights on the shore there are 171 none in the little window. Still, his mother may be safely asleep in bed, but his eager knocking meets with no reply. The terrible thought of death overwhelms his spirit, though he does not, cannot guess the awful truth. A form draws near the darkness and reveals the haggard countenance of a kinswoman who slowly tells the piteous story. The superstitious pedant King James VI had landed at Leith trembling at the terrors of the sea, and convinced that the spells of witchcraft had raised the storm that had threatened his sacred person. When kings demanded witches there were plenty to find them, and among the three that were found was the lonely old woman. Till she shriek’d and swooned awa’! Prest hard on his heart in woe. Down yonner upon the quay . . . The distraught man can hear no more: he rushes madly towards the pyramids of flame that redden the night. Close, close to the centremost form? That rings through the heart of the storm. And he falls on his face—and dies. While the Sabbath bells ring shrill. This is such powerful work that were any critic to declare Mr Buchanan pre-eminently a balladist it would be difficult to show effective reasons for dissent from his verdict. If, however, I were to ask myself the question ‘What 173 has this poet done that no one else has done at all, or done quite so well, or done quite in the same way,—in short, what is the unique element in his work?’ I should find its answer not in the longer narrative poems such as White Rose and Red, Balder, or his more recent allegorical volumes, not in such dramatic or semi-dramatic performances as Political Mystics and Saint Abe, not in his sonnets or miscellaneous lyrics, not even in his ballads; but partly in the London Poems and in other studies of the homely or terrible realities of the life of the poor, and partly in those remarkable contributions to the literature of poetic mysticism which are most adequately represented in The Book of Orm, the Celt. In his choice of subjects for the majority of his London Poems it may be frankly admitted that Mr Buchanan did not take an entirely new departure from recognised poetic conventions. He followed the lead of Wordsworth, who in the earlier days of the century had ‘sought the huts where poor men lie,’ and had succeeded in idealising the most apparently unpromising material, not by ignoring or tampering with prosaic details, but by exhibiting them in front of a moral or emotional background suffused 174 with a light which transfigured and glorified them. It may, however, be noted that Wordsworth had an advantage over the later poet, inasmuch as his poems of the poor were, mainly, indeed almost exclusively, rural idylls. The lowliest life spent in the country, howsoever prosaic in itself, is lived in an atmosphere which is essentially and obviously poetic; and for the imaginative cultivator of cottage domesticities the ground is, as it were, prepared. The poet of lowly town life has no such preparatory assistance. He has to mould to his purpose material which is not merely non-poetic but apparently anti-poetic; he has to deal with a life that is not simply unlovely but squalidly vulgar; and it was in setting himself to this special task that Mr Buchanan won the honours of the successful pioneer. It is not, however, the writer’s choice of theme but his victorious treatment of it which sets these poems in a place apart. Years before Mr Buchanan wrote the monologue of ‘Nell,’ in which the young mother who is not a wife pours out her agonised lamentations for the lover who is to die upon the scaffold, Thomas Hood had sung of the suicide of an ‘unfortunate,’ and by so singing had defied the old traditions of poetical respectability. 175 Still in the midst of the defiance there was a suggestion of compromise. Hood did not dare to be quite true to the actual, and the picture is accordingly painted with a delicately eclectic brush. Everyone knows that any presentment of such a subject as that treated in ‘The Bridge of Sighs’ in which there appears ‘only the beautiful,’ is not simply an idealisation but a distortion of reality; and while true idealisation may enhance the essential veracity of any work of art, this false idealisation must always detract from it. There are two errors into one of which those poets who deal with homely human themes are peculiarly liable to fall. The first is that of men who, like Hood, preserve the poetry by keeping back some of the truth; the second is that of a writer like Crabbe who lets us see all the truth, but is, as a rule, unable to show us the underlying poetry. There are few men who in delineating the wastes and morasses of the human landscape can give us both Dichtung and Wahrheit, but the name of one of the few is Robert Buchanan. The poem entitled ‘Liz’ provides an interesting and striking example of this strenuous fidelity to the central truth of things. ‘Liz’ is a girl of the slums who has never seen a green 176 field or walked between the hedges of a rural lane; and standing out among the memories of the short and troubled life she is leaving behind her is the memory of one day when she stole away from the familiar street and knew for once what the country meant. It is an attractive theme that lends itself readily to handling that is at once graceful, sympathetic and not apparently untruthful. If we ask what emotion supplies the obvious key-note of such a sketch, the almost universal reply would be the girl’s rapturous delight in the grass of the meadow, the flower by the wayside, the open undimmed sky. But Mr Buchanan will have none of it, and Liz feels no delight but only a strange homelessness—a dull wonder which is neither pleasant nor painful, but which seems further removed from pleasure than from pain. The air grew damp with dew. And the dark night was coming down I knew. My heart was busy, and I felt no fear. ‘The cheerful streets,’ ‘in London here my heart was busy and I felt no fear,’ ‘I could not bear a life so bright and still’—what strokes of penetrating truthfulness are these! We feel that the poet of ‘Nell’ and ‘Liz’ has that catholicity and virility of imagination which subjects the ‘shows of things’ to the ‘desires of the mind’ not by the timorous handling of eclecticism, but by the vigorous grasp of the athlete who wrestles with things evil and ugly, and will not let them go until they whisper their secret of beauty. is, in all human essentials, a figure who might have filled the central place in one of the London Poems. It is only the conditions that are reversed. In the earlier book we are before the veil; in the later book we are behind it; and to the emancipated imagination of the poet are disclosed the living forces which work for salvation in that inner light which to the eye of sense is but darkness. Perhaps for most readers the best way of studying this volume of mystical utterances is to read the last poem first,—as in it the informing idea of the whole work is seen free from the symbolism which, though to certain races—and to certain minds of every race—the most natural mode of presenting a 180 spiritual conception, is to the average Englishman a hindrance rather than a help. If, however, this method be adopted, the significance of the book can hardly be missed even by the most matter-of-fact reader. It is a vindication of that higher optimism which does not content itself with a lazy repetition of the maxim ‘whatever is, is right,’ but only with an assured faith in a Being whose existence and activity provide a guarantee that the thing which is and which is recognised as evil must be doomed to ultimate destruction. This is the plea itself; and the force of its emotional logic lies in the fact that the apparent incredibility of this conception of a prevailing goodness is frankly admitted—is indeed insisted upon through all the poems which are informed with the symbolism of the veil; and that yet, notwithstanding this insistence the final impression is not one of dubitation but of assured faith. THE EARLIER WORK OF ROBERT BUCHANAN. IN venturing on a brief survey of Mr. Buchanan’s earlier work, I have drawn the line at the publication of “God and the Man” in 1881; and that not wholly arbitrarily, for with a singular frequency men seem to become aware, shortly after turning forty, of a marked change in their out look on life; there is a new light on the landscape, a fresh feeling in the air, a suspicion, if not an actual perception, in their minds that they have reached “the second spring”; and one fancies one traces in the writings of the poets evidence that they too, in spite of their perennial youth, are subject to the ordinary dispensation. During the decade and a half which has since elapsed we have forgotten many men and many books—for after all we must live for our own day and in our own way—and among the latter there seems some reason to fear that we have too readily let slip from mind rather than from memory the large and splendid contribution which Mr. Buchanan made to our literature in the preceding twenty years. As one turns over the pages of his “Poetical Works,” perhaps the first thing that strike attention is the remarkable change which has taken place in the mode and method of poetry. The liberal canvas with its great design and free dashes of colour appears to be a thing of the past. We have grown lyrical and critical, timorous of size, intent on condensation and brevity, somewhat too exclusively anxious about form and beauty and perfection of phrase and cadence. It is not easy to escape the regret that we have not more abundantly the full-blooded vigour of the older generation combined with the delightful and fastidious workmanship of to-day. Then, too, the “Idyls and Legends of Inverburn” had appeared—the forgotten morning-star which shone over that lovable bleak northern plot of literature, conveniently if somewhat despitefully known as “the Kailyard.” Have “Willie Baird” and his dominie (the inevitable dominie, as Mr. Barrie complains) been forgotten? And does no one remember the homely tragedy of “Poet Andrew,” and the gaiety of “Widow Mysie”? In these early volumes one notices the broad, tender theology which appears again in “The Man Accursed,” “Judas Iscariot,” and elsewhere. But it was in the “London Poems” that Mr. Buchanan touched most acutely the quick of life; and I do not think it rash to say that never since has any one touched the same quick with such telling effect. Who that has read “Liz” can have forgotten the poor slum- child’s first venture from London into the green fields—the high green hill and the unclouded sun, and the smokeless blue, the trees and the soft wind and the singing of the birds? And who has surpassed in verse the poignant misery of “Jane Lewson”? In the space at my disposal it is impossible to do much more than refer to certain poems, but for the older generation at least the mention of the mere titles will alone bring back pleasant recollections. In these “London Poems” there are things that once known can never be wholly forgotten—“Edward Crowhurst,” the poor “new poet” who began with rapture at the plough and lapsed through vanity 109 and drink and neglect into madness; “Nell,” a creation Dickens might have fathered; the first of the Irish ventures, “The Wake of Tim O’Hara”; “Tom Dunstan, the Politician”—but what are these save unmeaning titles unless one knows the poems or will take the trouble to turn to them? In “North Coast, and Other Poems” the masterpiece to my mind—“A Scottish Eclogue,” in which the human-hearted Christianity of a poor Publican is unconsciously depicted by a Pharisaical elder—is pure “Kailyard” of the finest quality. The “Coruisken Sonnets,” thirty-four in number, are interesting to any one who wishes to follow the author’s religious development; as literature they do not appeal to me individually. So, too, in the “Book of Orm,” which was published in 1870, I can conceive a student of the Celtic revival being deeply absorbed, but with the exception of the sections entitled “The Lifting of the Veil” and “The Vision of the Man Accursed,” I find myself little in sympathy. But these exceptions are in themselves sufficient to make a reputation. Imagine the Face Divine gazing down unveiled on mankind—unveiled in compliance with the wild supplication of the world, who hardly know whether they should believe that there was any face at all regarding them in their inexplicable pilgrimage through sin and sorrow. The sight paralyses humanity; all action and thought stop at once; the shepherds on the hills, the fishers on the shore, in the cities rich men and lepers, the bride and the bridegroom, the bearers of the dead are all struck into stone—“each soul was an eyeball, each face was a stare.” And is not this an exquisite touch, brimful of beauty and true to nature? The vision of “The Man Accursed,” I think, must be known to every one—the vision of the fierce, wolfish brute, the one creature left unredeemed after the Judgment, who was cast out into the utter dark and cold, and to whom the women whom he slew or starved—mother and wife—went out of heaven to alleviate his misery; and the devotedness of these melted his stony heart and wrung from him that “piteous human cry” which saved him. what more perfect than the close, in which we see the “human beaver” remembering, between his cups, the golden romance of that long past adventure? All this is the work of a man of overtopping genius; at the back of it all one perceives, as the principal source of its strength and inspiration, and implicit appeal to the Christian sanctions and a profound recognition of the eternal order of righteousness. From Chapter VI: Later Victorian Poets (p. 373-379). Robert William Buchanan (1841) is a poet of such an undoubted faculty that one wonders that he should be so little known. It is certainly not because his poems lack interest. Nor is it because they are either limited in quantity or inferior in power. Their range is exceedingly wide, and they throb with an intense, sometimes almost a painful, interest. Still less can it be said of Mr Buchanan, as it might with justice be said of Mr William Morris, that he stands aloof from present day needs and circumstances. No one could utter more plainly the burden of ordinary human joy and sorrow. It is, therefore, the more surprising that he should be comparatively unappreciated, while the claims of writers who do not deserve to be mentioned along with him are persistently pressed upon the public notice. This is much to be regretted, for Mr Buchanan, if we mistake not, is a poet who, notwithstanding inequalities, has scarcely any superiors among English poets now living. Robert Buchanan was born in Staffordshire in 1841. His father was proprietor of a Glasgow newspaper and a journalist by profession. It was no doubt thus that Robert Buchanan received his bent towards literature. He was educated at the High School and University of Glasgow, where he made the acquaintance of David Gray, the author of The Luggie. In 1860 these youthful aspirants made their way to London, ambitious to win for themselves a name in the kingdom of letters. Poor Gray speedily succumbed, leaving London only to die. Buchanan, by dint of 374 energy, perseverance, and native genius survived the hard struggle through which he had to pass, and fully realised the object of his ambition. His first volume of poetry, Undertones, was published in 1860, and was followed five years later by Idyls and Legends of Inverburn (1865). The rawness of youth was to be seen in the first of these, as was also much that was suggestive and promising. In the second, and still more in the London Poems that followed in 1866, we see unmistakably a richly endowed poet, full of imagination, dramatic insight, humour, pathos, and an abundance of sympathy with the unintelligible anguish of life that so often meets us in the lowest human forms. Here was no playing with the gossamer hues of air-spun fancies. There is a terrible earnestness in these poems; and if at times we are tempted to revolt against the plainness with which the almost hopeless enigmas of life are set forth, we find comfort in the representation, again and again repeated, that after all the bad is not altogether bad, and that there is a saving leaven in human nature even at its worst. It is this that prevents such poems as Liz, Ratcliffe Meg, and Nell, from being positively repulsive. The North Coast Poems (1867) are full of the same sympathetic humanity, and deal with similar problems of common life, only substituting the scent of the heather and the salt breath of the long waves that beat upon northern shores for the pallid air of London streets. When we read such poems as Meg Blane or The Scaith of Bartle, we are confronted with forms of 375 human wrong and anguish that scarcely admit of earthly alleviation. Yet, after all, there is comfort in this poet’s view, even though it should be found only in the peace and solace of the great reconciler — death. Stole in, and fell at his feet. Scattered through all Mr Buchanan’s writings are passages of rare lyrical sweetness and melody. In such poems as the The Lights o’ Leith, he has caught with wonderful effect the simple and poignant spirit as well as the form of the ancient ballad. His pathos, of which there is no better example than this poem, is real and convincing. His humour is no less true, and finds an admirable illustration in the rollicking Wedding of Shon Maclean. The dramatic instinct is everywhere manifest in the way in which this poet seizes upon situations which give to the dramatist his opportunity, and also in the vividness with which he realises and portrays character. His narratives and descriptions of nature are marked by truth and realistic imagination. 377 Of Mr Buchanan’s other works in poetry may be mentioned Songs of the Terrible Year (1870), suggested by the Franco-German War; Political Mystics, Saint Abe and his Seven Wives, White Rose and Red, Balder the Beautiful, The City of Dreams, The Outcast (1891), and The Wandering Jew (1893). Prose fiction and the drama have for some years engrossed most of Mr Buchanan’s attention, and in both he has won considerable success. From The Lights o’ Leith the following extracts are taken. A ship is running for the port amidst a wintry gale of snow and hail; and through the surging spray the sailors see the town aflame with dancing lights. A boat is launched to take the skipper and the mate ashore. The latter tells the skipper how twenty years ago, he, the son of a drowned father, and an only child, ran away to sea; how he had thrice returned from his wanderings, always, although empty-handed, to receive the kindliest welcome from his poor old mother; and how, now that his wanderings are over, he will comfort her with his presence and the wealth he has acquired. The siller intil her lap! Hurrying to his mother’s cot, he finds it black and tenantless. Tortured by his fears, his cousin, ‘lame Janet Wylie, frae Marywell,’ finds him, and, after much urging, tells him a tale so horrible that life for him is no longer possible. Her story was, that the bent form of his old mother had come to be regarded as that of a witch, and that when the cowardly pedant, ‘King Jamie,’ was driven into port by stress of weather, search was made for the witches whose spells were believed to have caused the storm. Is kinder than cruel men! Till she shriek’d and swoon’d awa’! Prest hard on his heart in woe! “O Robin, Robin . . . they doom’d her to burn . . .
Doon yonner upon the quay . . . This night was the night . . . see the light! His eyes on the lights below! High up on the quay, blaze the balefires, and see! With the fire flaming redly around! Close, close, to the centremost form? That rings thro’ the heart of the storm!